Felicia Heinz is a passionate gardener with a giving heart. As soon as I stepped into her backyard, I spotted her abundantly growing vegetable garden yet was surprised to learn she hasn’t always loved growing things. Heinz has been “seriously gardening” for about eight years and has mostly learned through trial and error and from a lot of reading. 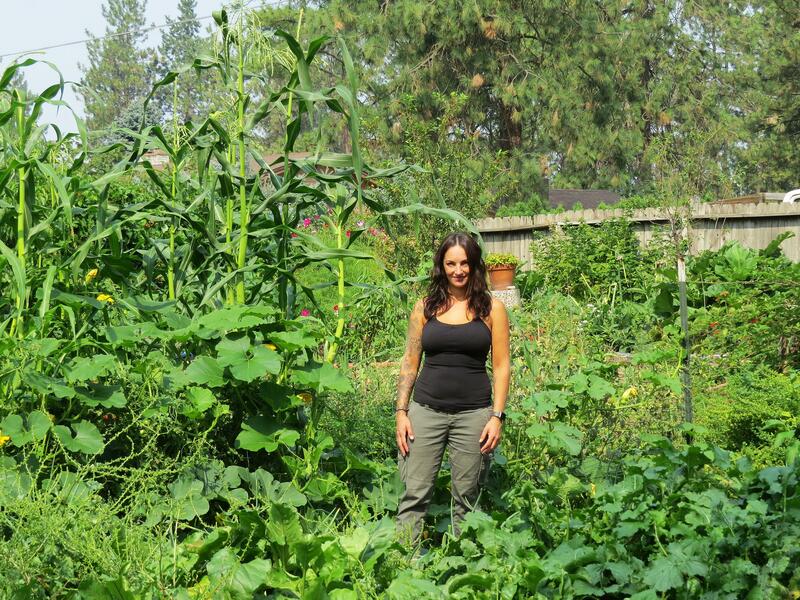 She lives on a quarter-acre lot in north Spokane and has been continually expanding her garden over the years. She has 15 raised beds that are 4 feet wide and 10 to 12 feet long as well as many other planting areas. In addition to growing all sorts of vegetables, she has planted fruit trees and berries and has chickens because though she’s vegan, other family members aren’t. While Heinz grows the types of veggies you would expect, she has also sought out some unusual crops such as Malabar spinach, cucamelons, Jerusalem artichokes, English and Armenian cucumbers, sea kale, Lebanese zucchini and Good King Henry (Chenopodium bonus-henricus), which is an alternative spinach. She even grows sweet potatoes in her zone 6 garden, which will probably make most Inland Northwest gardeners green with envy. Her quest for healthful and interesting varieties doesn’t stop with vegetables, however. In addition to growing raspberries, blueberries and strawberries, other small fruits include jostaberries, champagne currants, gooseberries, honeyberries and goumi berries. Her fruit tree collection contains the usual plums, pears, peaches and apples, along with pawpaws, jujubes, persimmons and Chicago Hardy figs. “I feel that the more variety of plants you grow, the more nutrients you get in your body,” she said. Heinz grows everything organically and believes in living sustainably. How does she do this? Heinz uses the no-till method in her garden, to avoid damaging the soil structure, and follows permaculture principles. One example of this is planting “guilds,” or groupings, of plants. This year, she is focusing on attracting pollinators to the garden by setting up a mason bee house and has planted flowers to draw in hummingbirds. “I give away whatever I don’t use,” she told me. “It started with my elderly neighbor who asked me if I grew Delicata squash, so I bought the seeds and grew them for her. I give boxes of produce to people or tell them they can come over and harvest what they want. Susan Mulvihill is co-author, with Pat Munts, of “Northwest Gardener’s Handbook.” Contact her at Susan@susansinthegarden.com. Watch this week’s “Everyone Can Grow A Garden” video on youtube.com/c/susansinthe garden.